I have come to the conclusion that I may never catch up on the posts I have missed. Nonetheless, I soldier on. Today’s Awesome Thing is: The History of the World, through Facebook posts. Oh Facebook… you’re an engine for drama, and for the destruction of the English language (not to mention people’s privacy). And yet, there’s something to be said for the way you simplify the world. College Humor used this to great effect when condensing the history of the world into something easily read in a few minutes. I confess: I laughed a lot. Okay, okay, I’m sure you’re thinking, “Kat, seriously? What are you talking about? The dude on the cover is pixelated and looks like a stalker! Plus this is a textbook. How can this possibly be awesome?” I’ll tell you: it’s hilarious. Despite what the creepy cover may suggest, this is actually a well-written, entertaining textbook. I had to read a chapter of it last week for a web-design class I’m taking, and I liked it better than my regular textbook. This one contains excellent asides like, “The United States, for example, follows a unilateral specification called Section 508 instead of WCAG 1.0, possibly to avoid doing anything the French do.” It came out of the blue and made me laugh aloud–which confused my boyfriend, as I was studying. This is the first time I’ve actually considered buying a textbook that wasn’t assigned for a class, just because it seems funny. Fortunately, it’s only $35, which is about the price of a hardcover these days. If you’re curious, you can check it out here. 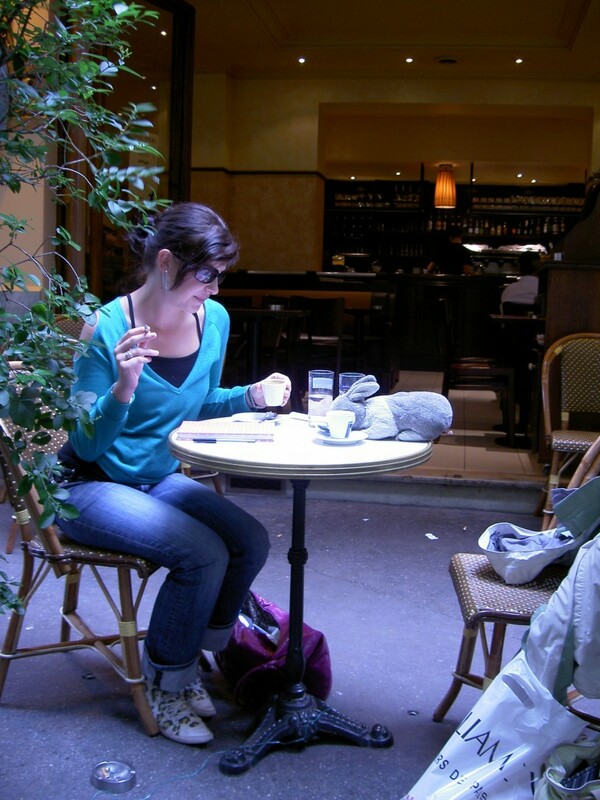 This was another of the “secret agent bun” photos from Paris. I love how completely non-sequiturial it is. The girl shown is named Renae, and she’s from Australia. She and I were staying in the same hostel. I ran into her at the café near the hostel, and just randomly asked her if I could take a picture of her with my stuffed rabbit. I think she was sort of bemused, but went along with it. The resultant image never ceases to amuse me. The only thing I was was that Bunbun’s head was not behind a cup. Seriously, though, doesn’t it look like a conversation between dear friends? Hilarious. And awesome!